Edward Codrington (1803-1819), Brother of Sir William John Codrington. Sitter in 1 portrait. Sir William John Codrington (1804-1884), General. Sitter in 5 portraits. The son of Sir Edward Codrington, the British admiral who captained the 'Orion' at the Battle of Trafalgar, William Codrington entered the army in 1821 and was promoted to the post of major-general in 1854, the year in which the Crimean War broke out. Having distinguished himself at Alma and Inkerman, he was appointed commander-in-chief at Sebastopol and was later made governor of Gibraltar (1859-65). 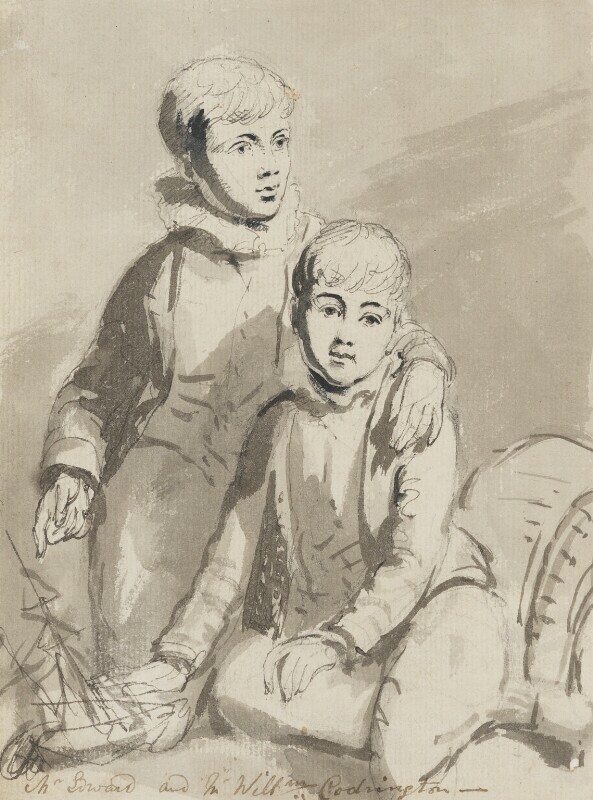 He is seen in this study as a young boy together with his brother Edward, who died at the age of sixteen. Prime Minister Spencer Perceval is assassinated in the lobby of the House of Commons by a bankrupt named John Bellingham. A new administration is formed under Lord Liverpool. The Toleration Act is passed giving greater freedom of worship to dissenters in order to ensure their political loyalty. Actress Sarah Siddons retires from the London stage. Her final appearance is as Lady Macbeth, the role that made her famous, but the performance has to end after the sleepwalking scene because of the fervour of the audience. Building of Regent's Canal begins under John Rennie. United States declares war on Britain over grievances arising from British naval conduct in the French wars. American plan for attack on Canada fails and British troops under Sir Edward Pakenham force surrender of Detroit. Wellington defeats French at Salamanca and enters Madrid. Napoleon leads France in disastrous Russian campaign.